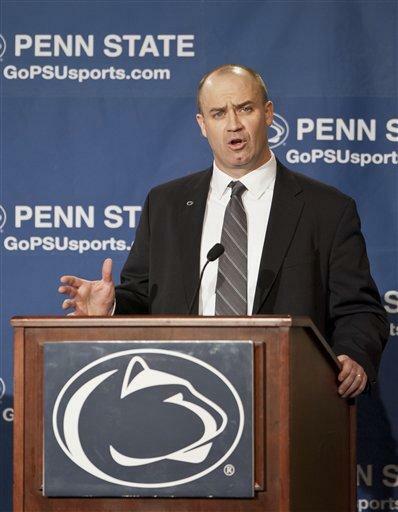 Bill O'Brien is the 15th head football coach in Penn State history. It was Penn State's own little Brady moment. The question came from, literally, the top of the 50-person huddle of reporters, amidst the cameras and digital recorders and iPhones and notebooks. 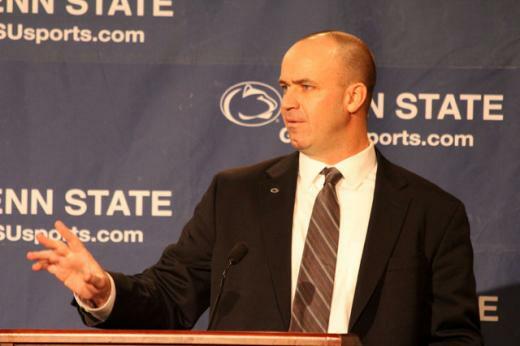 Enveloped in the middle of the muddle on Saturday was 42-year-old Bill O’Brien, newly-announced as Penn State’s 15th football coach. The question didn’t come out of left field – more like the edge of a claustrophobic media circus…er, circumstance. It was, however, unexpected. It questioned O’Brien’s abilities as an offensive coordinator, a position he now holds with the New England Patriots, the team with the top record in the AFC. O’Brien was an OC for four years at the college level, at Georgia Tech (2001-02), where he had coached for eight years, and later at Duke (2005-06). The reporter reframed the question: “When you were offensive coordinator (2001-02)…"
O'Brien broke in, with attitude: “…In 2001, when I was offensive coordinator at Georgia Tech we led the league. I had a quarterback, George Godsey, who threw for 3,000 (yards). I think he set a record that year. He threw for more yards than many, many teams in that league. “Next question,” the new coach said. He turned his head in the other direction. Bill O’Brien wasn’t going to take anything from anybody. Not even on the day of his coronation before the Nittany Nation. In 2001, Godsey was the No. 1 passer in the Atlantic Coast Conference, with 3,085 yards, 18 touchdowns and 11 interceptions for 24th-ranked Georgia Tech. Godsey averaged 257 yards per game. That’s 80 more than PSU averaged in 2011. And get this: Tech’s Joe Burns, with 1,165 yards, was the ACC’s No. 2 rusher. Tough. Surly. Gets names and numbers correct. Bill O’Brien was born on Oct. 23, 1969, in Dorchester, Mass., Boston's largest and most populous neighborhood located south of the city. Dorchester is the kind of place where the street-smart characters played by Mark Wahlberg are from. In fact, it is exactly the place where Mark Wahlberg himself is from. Captain Squib landed there in May 30, 1630. Squib was British. O’Brien is Irish. O’Brien doesn’t apologize for that or for his infamous run-in – “It wasn’t an altercation,” he said on Saturday – with Gisela Bundchen’s husband 27 days ago on national TV. “I’m an intense guy,” O’Brien said. “I have an Irish temper. I grew up 20 minutes outside of Boston, so I’m a New Englander. If something gets me upset, I’m going to let people know. That thinking side is more in line with his Andover upbringing. Andover is a small town of about 33,000 people located 22 miles north of Boston and 30 miles to the south of Manchester, N.H. Phillips Academy, the famous prep school, is in Andover. When it came time for college, O’Brien headed 75 miles south to Providence, R.I., and Brown University. He will, of course, be the third consecutive man with Brown connections to lead Penn State football on a permanent basis. Rip Engle came from Brown in 1950. Joe Paterno, who came along with Engle and was an assistant coach for 16 years, became head coach in 1966. And then there’s O’Brien, who officially took the reins from interim boss Tom Bradley, when he inked his $2.3 million contract on Friday night. On the field, O’Brien will let there be no mistake who’s no charge. No offense, Penn State. No longer. Bill O’Brien has the high forehead, balding scalp, workmanlike face, sharp blue eyes and Kirk Douglas chin of Ed DeChellis. His head is shaved nearly bare, ala fellow newbie Pat Chambers, and for two years O’Brien’s workplace (Gillette Stadium) was just miles up Routes 93 and 95 to Chamber’s at Boston University. They can talk Faneuil Hall, Durgin Park restaurant and the Sox. As O’Brien addressed a crowd of about 300 people in the ballroom of the Nittany Lion Inn, his hands grasped the podium, his knuckles clenched. He wore a starched white shirt, a dark suit, a heavy blue tie with thin grey stripes, with a Nittany Lion logo pin on his right lapel. His attorney wife and one of his two young sons, Michael, sat in the front row. It seemed like he would rather be wearing coaching sweats. You also know he’s dying to get onto the field inside Beaver Stadium. How? He was heard marveling at the “108,000-seat stadium” at least four times. O’Brien said it’s nine months – actually, 238 days – until Penn State opens its 2012 season at home on Sept. 1 against Ohio. The team will still be Penn State’s. And O’Brien certainly seems to understand the program’s traditions. He even made several overtures to the football lettermen. But he also doesn’t seem shy about being who he is, and what his stamp will be when the Nittany Lions – his Nittany Lions -- start spring practice in 10 weeks. “I’m not here to be Joe Paterno. There’s only one Joe Paterno,” he said. He emerged from the back door and stood with his hands folded in front of his waist, his eyes, awash in blue, looking out toward a packed room of reporters, photographers, fans, administrators, donors and alumni.